Dr. K. Chandrasekharan is a Senior scientist with Central Silk Board, India. He obtained his BSc and MSc degrees in Zoology from the University of Calicut, Kerala. His Ph.D was from the University of Mysore on white muscardine disease of silkworm caused by Beauveria bassina. Before joining CSB he had worked on the biological control aspects of pests of coconut, with special reference to the parasitoid hyperparasitoid interaction of the coconut pest Opisina arenosella in the field, as a UGC/CSIR fellow. In CSB his initial work was in Tasar sericulture sector. After moving to the Regional Sericulture Research Station , Kodathi, Bangalore he worked for a short spell on transfer of technoloies to the field. There after till now his work is at the Silkworm Pathology Laboratory at the Central Sericultural Research and Training Institute at Mysore. Presently he is engaged in developing suitable strategies for the management of silkworm diseases. The team he is working with has developed and commercialised a number of products for managing silkworm diseases, which are commercialised in the trade names 'Asthra, Ankush, Amruth, and Vijetha supplement'. He has published nearly 120 papers and supervised 6 students for their MSc dissertations. 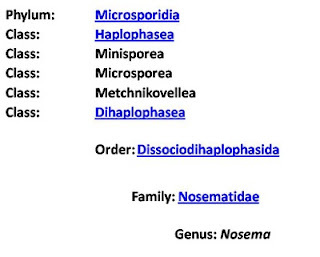 Microsporidia are a group of obligate eukaryotic intracellular parasites first recognized more than 150 years ago with the description of Nosema bombycis the parasite causing pebrine disease in silkworms. Microsporidia infect almost all animal phyla and among the more than 144 described genera, several have been demonstrated in human disease. Pebrine caused by the microsporidian, N. bombycis is one of the most dangerous and devastating disease in silkworm. This disease devastated sericulture industry in several countries and even it wiped out the industry from some of the European countries. This disease was first reported during 1845 in France and later spread to several other European countries. In 1870, Louis Pasteur developed a practical method to control the disease which saved the industry during that time and this method of mother moth examination is still followed to prepare and supply pebrine free layings. Several microsporidia other than N. bombycis (Vairimorpha sp., Pleistophora sp., Thelohania sp. etc.) are also reported as causative agents of this disease. They mainly transmit by ingestion of spores (horizontal transmission) and in addition, many species of microsporidia are transmitted vertically or trans-ovarially (generation to generation) from an infected adult female to her offspring, either through the egg surface or within the egg.Microsporidia are primitive eukaryotes with well defined nuclei and plasma membrane but lack some typical organelles found in the typical eukaryotes like mitochondria, stacked Golgi and peroxisomes. 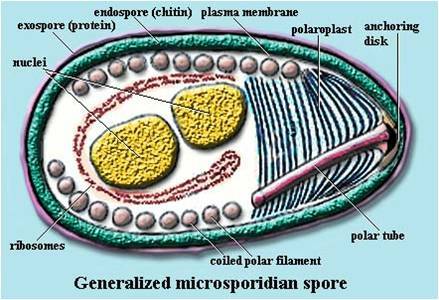 Microsporidian spores have a characteristic coiled polar tube, tubule or filament, layered polaroplast, a posterior vacuole and protective exospores made up of proteins and chitin which is responsible for the spores’ high environmental resistance. 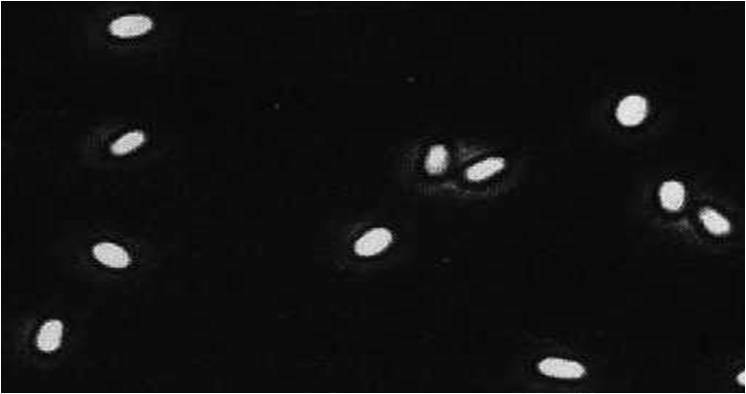 Microsporidia infiltrate into the host cells through the polar tube or polar filament found in the spore. They are widely distributed in nature with over 1200 characterized species. Recently microsporidia have also been documented as parasitic to human beings. Although the largest number of microsporidian species infect arthropods (especially insects), most animal phyla contain at least a few species that are infected by microsporidia. Microsporidia was later elevated into a separate phylum called Microspora under sub kingdom Protozoa which was erected in 1969 to accommodate this unique group of organisms (Sprague (1969, 1977), Levine et al. (1980)). Sprague et al. (1992) introduce a different classification system, based on whether the species is diplokaryotic at some point in the life cycle (Dihaplophasea) or uninucleate throughout its life cycle (Haplophasea). The Dihaplophasea are further separated into those in which the diplokaryon is formed through meiosis (Meiodihaplophasida) and those in which the diplokaryon is formed through nuclear dissociation (Dissociodihaplophasida). ﻿Many mycologists and invertebrate pathologists now consider that the Microsporidia have been proven beyond any reasonable doubt to be comparatively recent and highly derived endobiotic fungi. They are neither extremely ancient eukaryote nor affiliated with protozoans as most textbooks indicate. None of this realignment to the fungi is being disputed by either microsporidiologists or phylogenetic mycologists. The rationale for this realignment is well presented by James et al. (2006). These fascinating organisms connect to the fungal tree of life at the base of the nonflagellate fungi (among or near the fungi traditionally treated as the Zygomycota) but their exact affinities and nearest remain uncertain. Recent scientific studies using genetic tools have proved that microsporidians are more fungal than protozoal in nature. Now pebrine can be better classified as a mycosis rather than microsporidiosis. James et al (2006) developed the phylogenetic hypotheses for Fungi using data from six gene regions and nearly 200 species. The results indicate that there may have been at least four independent losses of the flagellum in the kingdom Fungi. These losses of swimming spores coincided with the evolution of new mechanisms of spore dispersal, such as aerial dispersal in mycelial groups and polar tube eversion in the microsporidia (unicellular forms that lack mitochondria). The enigmatic microsporidia seem to be derived from an endoparasitic chytrid ancestor similar to Rozella allomycis, on the earliest diverging branch of the fungal phylogenetic tree. The recent results using RPB1, a- and b-tubulin, and other genes, have suggested a fungal origin of the microsporidia (Hirt et al.,1999; Katinka et al., 2001 and Keeling 2003), a placement consistent with their having the shared traits of closed mitosis and spores that contain chitin and trehalose (Cavalier-Smith, 2001). Only one study has placed the microsporidia with a specific fungal lineage, in which a relationship was demonstrated between members of the Zygomycota and microsporidia by using tubulin proteins (Keeling, 2003). However, tubulin proteins seem to have evolved at different rates in flagellated and non-flagellated fungi (Keeling, 2003; Corradi et al., 2004). Presently work has focused on the determination of the nucleotide sequences for ribosomal RNA (rRNA) genes, which have been used as diagnostic tools for species identification as well as for the development of a molecular phylogeny of these organisms. Microsporidia have historically been considered to be “primitive” protozoa, however, molecular phylogenetic analysis has led to the recognition that these organisms are not “primitive” but degenerate and that they are related to the fungi and not to other protozoa. Molecular phylogeny has also led to the recognition that the traditional phylogeny of these organisms based on structural observations may not reflect the “true” relationships among the various microsporidia species and genera. Studies using DNA techniques indicate phylum Microspora should be classified under the Fungal kingdom or at least as a sister kingdom to Fungi. The class, order and family within the Microspora phylum are also frequently revised and debated. Traditionally, species were identified by observing the physical characteristics of the spore, life cycle and relationship with the host cell. However, studies using genetic tools (namely ribosomal RNA sequencing) have challenged this approach and suggest genetic markers a more correct method for scientific classification. More research is still needed to better understand the origins of microspora and of individual species. Liu et al., (2006) concluded in their studies that Microsporidia are the sister group of the rest of the Fungi and should not be classified as true Fungi, but that topology does not conflict with the delimitation of the monophyletic Fungi as proposed here. The analysis of James et al. (2006) suggested that Rozella, which was not sampled by Liu et al. (2006), is the sister group of the Microsporidia. Based on the genetic analyses of Keeling et al. (2000), Gill & Fast (2006), James et al. (2006) and Liu et al. 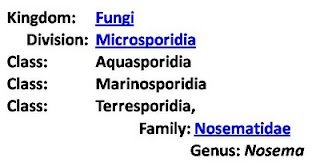 (2006) phylum microspora has been included under the fungal kingdom in the recent phylogenetic classification of fungi by Hibbett et al. (2007). No subdivision of the Microsporidia is proposed, in the classification by Hibbet et al (2007) owing to a lack of well-sampled multilocus analyses of this group. The study of microsporidia has reached the breaking point where the classical cytology, which has been the base of microsporidian studies since the very beginning, has lost its importance and it has actually been replaced by the molecular biology. Vossbrinck and Vossbrinck (2005) have adopted the new view, and the result is a new phylogeny and a new classification for a selection of microsporidian species. 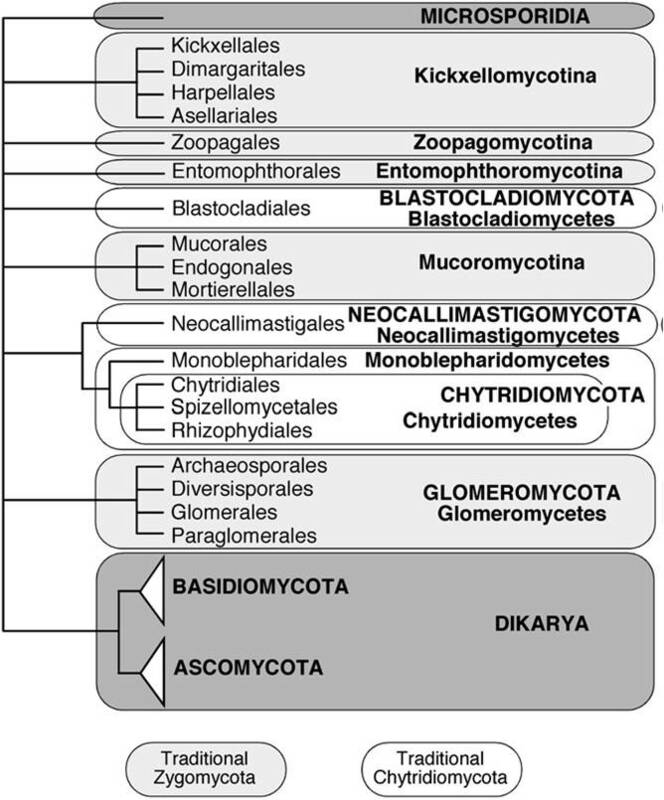 Five major clades with three taxonomic (class) designations in the phylum Microsporidia were identified in the phylograms. In the Class Aquasporidia, primarily parasites of freshwater organisms are included. The majority of the marine Microsporidia are designated as the Class Marinosporidia, which represents the parasites of marine hosts. Microsporidia isolated from terrestrial hosts are designated into the Class Terresporidia, and are mainly parasites of insects with economic importance. The new classification necessitates a paradigm shift in our understanding about the pebrine disease in silkworm. More over the new understanding may revolutionise our strategies to mange pebrine disease of silkworm. Balbiani G. (1882) Sur les microsporidies ou psorospermies des articules. C. R. Acad. Sci. 95: 1168–1171. Corradi, N. et al. (2004) Arbuscular mycorrhizal fungi (Glomeromycota) harbour ancient fungal tubulin genes that resemble those of the chytrids (Chytridiomycota). Fungal Genet. Biol. 41, 1037–-1045. Doflein F. (1901) Die Protozoen als Parasiten und Krankheitserreger nach biologischen Gesichtspunkten dargestellt. Jena. Gill E. E. and Fast N. M. (2006) Assessing the microsporidia–fungi relationship: combined phylogenetic analysis of eight genes. Gene. 375: 103–109. Goldfuss G.A. (1817) Zber die Entwicklungsstufen des Thieres. L. Schrag, Nurenberg. Hibbett et al. (2007) A higher-level phylogenetic classification of the Fungi. Mycological Research. 111: 509-547. Honigberg et al. 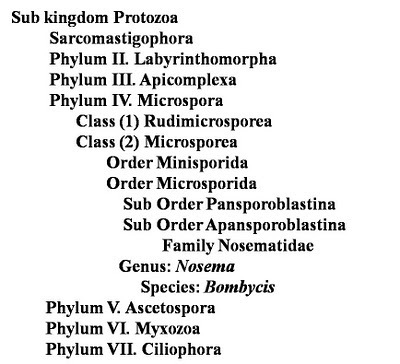 (1964) A revised classification of the phylum Protozoa. J. Protozool. 11: 7-20. 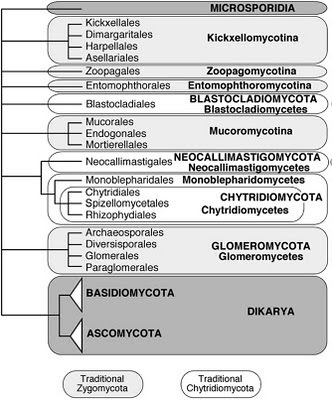 James et al (2006) Reconstructing the early evolution of the fungi using a six gene phylogeny. Nature. 443:818-822. Keeling P. J. (2003) Congruent evidence for alpha-tubulin and betatubulin gene phylogenies for a zygomycete origin of Microsporidia. Fungal Genetics and Biology.38: 298–309. Keeling P.J. et al. (2000) Evidence from beta-tubulin phylogeny that Microsporidia evolved from within the fungi. Molecular Biology and Evolution. 17: 23–31. Levine et al. 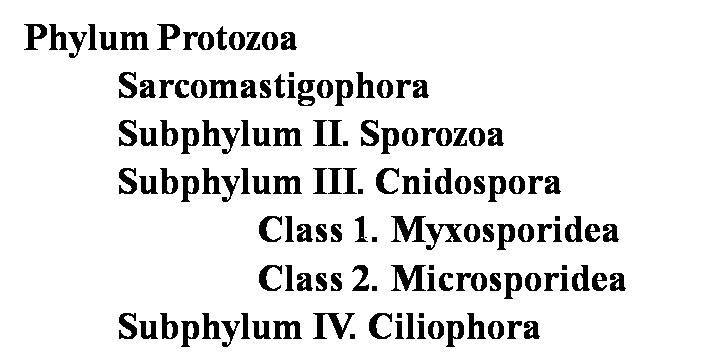 (1980) A Newly Revised Classification of the Protozoa. J. Protozool. 27(1): 37–58. Liu Y. J. et al. (2006) Loss of the flagellum happened only once in the fungal lineage: phylogenetic structure of kingdom Fungi inferred from RNA polymerase II subunit genes. BMC Evolutionary Biology 6: 74. Siebold C. T. E. (1845) Lehrbuch der Vergleichenden Anatomie der Wirbellossen Thiere. In: Lehrbuch der vergleichenden Anatomie 1 (Eds. von Siebold C.T.E. and Stannius H.). Berlin. Sprague, V. (1969) Need for drastic revision of the classification of subphylum Amoebagena. Progress in Protozoology, 3rd Internationla Cong. Protozool. Lenningrad. 372. 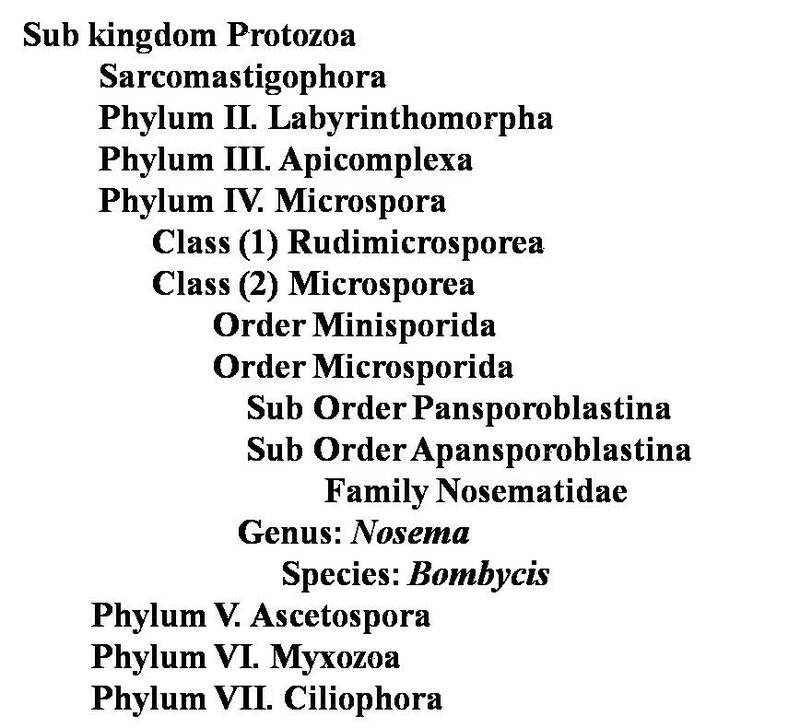 Sprague, V. (1977) Classification and phylogeny of the microsporidia. In: Bulla, L. A., and T. C. Cheng, (Eds.) Comparative pathobiology, Vol. 2. 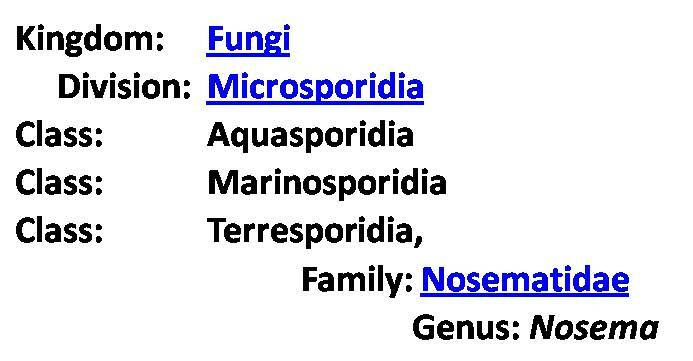 Systematics of the microsporidia. Plenum Press, New York. Sprague, V. et al. 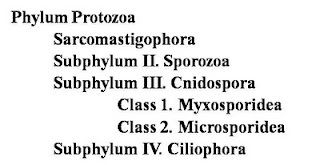 (1992) Taxonomy of phylum Microspora. Crit. Rev. Microbiol. 18: 285–395. Vossbrinck C. R. and Debrunner-Vossbrinck B. A. (2005) Molecular phylogeny of the Microsporidia: ecological, ultrastructural and taxonomic considerations. Folia Parasitologica. 52: 131–142. I have a message for the webmaster/admin here at silkwormmori.blogspot.com. May I use some of the information from your blog post right above if I provide a link back to your site? This is a inquiry for the webmaster/admin here at silkwormmori.blogspot.com. Can I use some of the information from this post above if I provide a link back to this site? This is a question for the webmaster/admin here at silkwormmori.blogspot.com. Can I use some of the information from this post right above if I provide a link back to this site?